It’s that time of year again. The smell of pumpkin spice is in the air and orange and black colors are popping up everywhere. Autumn is here. With that, comes fun designing trends. 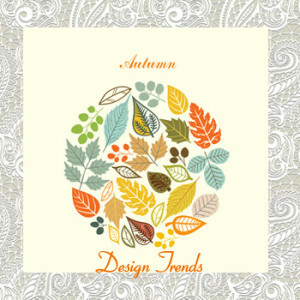 One big way to design for the season is to change the look and feel of any room with furniture, paint, or accessories. The hottest furniture trends for this fall are anything but subtle. Glamour, metallic leather, and pleats are ways to spice up your room. Some of the hottest pattern trends this fall are floral, faux bois, animal prints or animal accents (but don’t mix the animal prints together, pick one and go with it), prep, plaid, chevron, tribal print, and Indian style with paisley. With all the busy patterns and furniture to choose from, this year’s paint forecast from PANTONE® is following suit. Emerald, Acai, Mykonos Blue, Samba and Vivacious are the daring bold colors of the 2013 fall season. However, more common colors are the Linden Green, Koi, Deep Lichen Green, Turbulence and Carafe. These colors combined with the aforementioned patterns will allow for sophisticated and lively flair to more of thoughtful and conservative mood and feel this year. Here are a couple things you can do to spice up your room for fall. Update the room with new throw pillows. This is an inexpensive cozy trick that will allow you to add some color into the dreary room on a cold day. Layer your area rugs. It’s an easy way to add color and texture to any room. There aren’t any particular rules for layering except to make sure that the bottom rug pokes out below. Mix and match styles, textures, and patterns. Even mix and match modern with retro look. Seek out vintage pieces of furniture that you can dress up with bold fabrics and colors. Gray is the way. Gray cabinets, countertops and floors are making their ways into the design for all seasons. By combining various shades of gray, you portray a rich look and feel in the room. Change out your summer shades. If in the warmer months you have chosen lighter shades or airy curtains to cover the windows, trade them out for something more insulated and cozy. Draperies that have vibrant patterns like the ones stated above will get you ready for fall by adding natural warmth within the space of the room with a little bit of color. There are so many patterns, colors and textures to choose from this year, it will be hard to get anything wrong. So grab your pumpkin spice latte, a pillow and a warm throw; then cuddle up to the fireplace and enjoy your new room for fall.